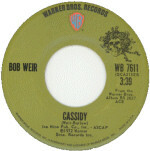 Cassidy was first performed by the Grateful Dead in March 1974 nearly 2 years after it appeared on the Ace LP. The 1974 performance was a one-off. The song returned to the Grateful Dead repertoire in June 1976 and was then performed regularly every year until July 1995. In total it was performed over 330 times.